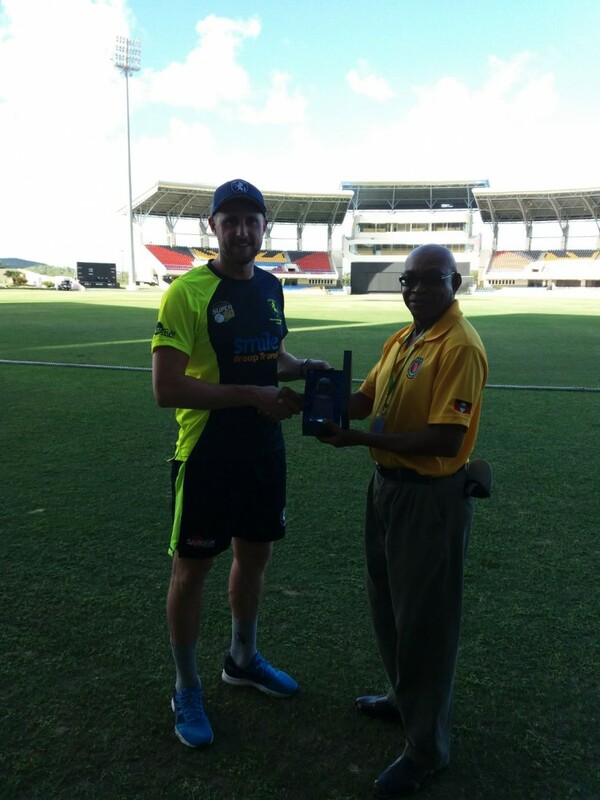 Alex Blake and career-best figures by Joe Denly and Ivan Thomas inspired Kent to a fine four-wicket win against Jamaica on the FGS Plant Tour. The Scorpions won the toss and chose to bat at the Sir Vivian Richards Stadium with a side featuring several international stars. Ivan Thomas struck twice in his first two overs with the new ball – claiming the scalp of record-breaking West Indies opener Chris Gayle and fellow international Chadrick Walton. The tall seamer, who spent much of the winter in South Africa working with new assistant coach Allan Donald, struck again in the 8th over as Jermaine Blackwood picked out Joe Denly at mid-on. Tour skipper Denly then brought himself into the attack to great effect: Gavin Russell nicked behind to Rouse before he bowled West Indies all rounder Rovman Powell in his opening over. Another international star was dismissed in similar fashion in his next over as he bamboozled Andre Russell before bowling Peat Salmon to claim his first four-wicket haul for Kent. Andre McCarthy was the only lynchpin in the Jamaican line-up, posting 76 including a fine stand of 49 with Nikita Miller before Calum Haggett removed both men in quick succession. McCarthy was clean bowled before Adam Rouse pouched an edge from Miller before Thomas returned to wrap up the innings for 156. After the early end to Jamaica’s innings, there was a quick turnaround as Kent were forced to face nine overs before the interval. The top order, fresh from their exertions in the field, wobbled with the loss of Bell-Drummond, Crawley and Dickson before the break. Will Gidman and Denly got starts before departing as Jamaica reduced Kent to 47/5 before a pivotal partnership changed the course of the game again. Alex Blake and Adam Rouse did not panic, pacing their innings superbly with plenty of overs remaining to reach the modest target. The pair put in 72 in 21 overs where resistance and accumulation, rather than aggressive strokeplay, were the order of the day on a tricky surface. Rouse was out for a nuggety 28 before Blake saw Kent over the line with his tenth boundary, earning him his ninth one-day half century and the Man of the Match prize. Next up is a match against the hosts, Leeward Islands Hurricanes, on Tuesday (1pm GMT) at the same venue.